We came across Troubles with Bubbles (New Readers Series) book at the library. It was CJ who wanted to bring the book home because of the pink bubbles on the front cover. After reading we found the book was fun to read too. The phrases are simple and repetitive, appealing an early reader. CJ almost memorized the book and she reads it to me. The Zoo animals in the book are playing in a playground. As the animals get dirty, they go to the zookeeper single or in a group and they tell him that they are dirty and want to be clean. The zookeeper gives them a soap and towel, asks them to scrub with soap and water. At the end, all the animals are in one big tub covered with bubbles. The zoo keeper sprays water on them until they are clean. It's also a counting book. In the first page we have ten zoo animals. The animals go to the zoo keeper in the increasing order, first the monkey, second batch - lion and the tiger, third batch - Giraffe, Ostrich and Snake, Fourth batch - Rhino, Elephant, Bear, Crane. The animals either use the phrase "I am dirty. I want to be clean" or "We are dirty. We want to be clean"
The zoo keeper repeats the phrase "Go to the tub and scrub with soap and water"
The illustrator provides a clever hint of the trouble, as each animal uses soap, more and more bubbles creep across the pages and it becomes obvious that there is some trouble with the bubbles. What other project would go with this book, better than washing the soft toys, CJ's animal friends! We took a Dish tub and filled it with water. I added few drops of body wash and Let CJ mix/whisk the body wash with the water. I Dusted the dust off the toys using a plain Kitchen tissue. 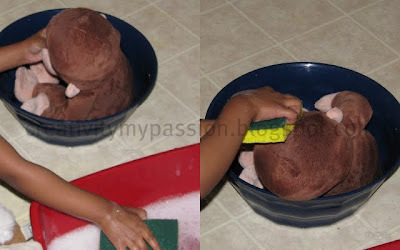 Using a Scrub, I asked CJ to apply foam on the Soft toys and scrub them clean. CJ thought Curious George needed a Bath tub to sit and anyway that way the soap wont get on the floor too. So I gave her one more plastic tub. 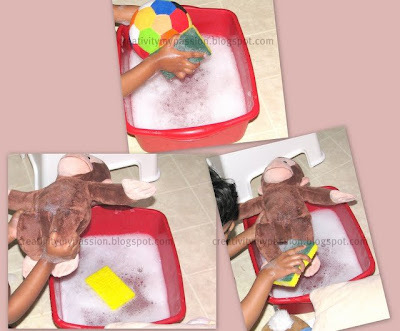 We wiped off the foam from the toys using kitchen tissue and then we gave them a wash by dipping them in plain water. Dried the soft toys using towels and finally we dried them in the dryer. If you are washing your soft toys, prior to putting the toy within the dryer/washing device, check for instructions and warnings on the soft toy's label. All of our toys had dry wash label but we took the risk of washing and drying in the dryer. How do you clean your soft toys? Oh my two would LOVE giving all their toys a good clean... in fact, they would probably clean the whole floor and themselves too! Thank you for joining Kids Get Crafty!! I know some kids that would love this one too! Thanks for sharing!! I will remember these things before cleaning up the toys.. Thanks for sharing..